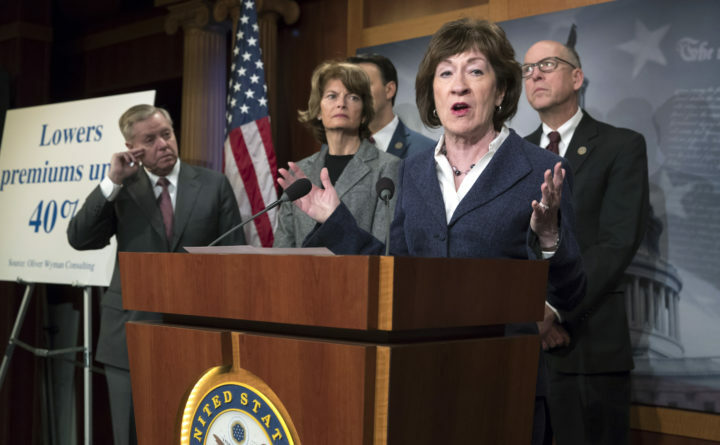 Sen. Susan Collins, R-Maine center, joined by, from left, Sen. Lindsey Graham, R-South Carolina, Sen. Lisa Murkowski, R-Alaska, and Rep. Greg Walden, R-Oregon, speaks during a news conference on Capitol Hill in Washington, March 21, 2018. U.S. Sen. Susan Collins of Maine on Sunday criticized former FBI Director James Comey for releasing his memoir amid the ongoing Russia investigation, saying it could disrupt the probe. Comey, who as FBI director led the investigation into Russian interference in the 2016 presidential election, last week released his memoir, “A Higher Loyalty: Truth, Lies and Leadership,” which was sharply critical of President Donald Trump. In various television appearances, Comey has suggested it’s possible Russia has leverage over the president and has called Trump “morally unfit” to be president. His firing last May led to the appointment of Special Counsel Robert Mueller to lead the investigation into Russian interference in the election and possible collusion with the Trump campaign. Collins, a Republican who sits on the Senate Intelligence Committee, which is conducting its own Russia investigation, said that if she were advising future FBI directors, she would tell them two things. During her appearance on “Meet the Press,” Collins also waded into a debate over legislation to protect Mueller. Congress needs to have the debate to “send a clear message” to Trump that the legislative branch doesn’t support him taking action against Mueller, she said. On Thursday, Senate Judiciary Chairman Chuck Grassley, R-Iowa, announced that his committee will vote this week on a bill to protect Mueller over the objections of Senate Majority Leader Mitch McConnell, R-Kentucky, according to USA Today. “Where there are issues of national importance, such as the appointment of special counsels and the investigation of a sitting president, Congress must consider its constitutional role and act to make sure that it can avail itself of its traditional checks against the executive branch,” USA Today quoted Grassley as saying. But McConnell told Fox News on Tuesday that he would not bring the bill to the Senate floor for a vote even if approved by the Judiciary Committee. But it’s also unlikely that Trump would sign the bill into law if passed, Collins added. Congressional Republicans for months have debated whether to pass legislation to protect Mueller. That debate flared up in late January after The New York Times reported that Trump sought in June to fire Mueller weeks after he took over the Russia investigation. Trump reportedly backed off when White House Counsel Donald McGahn threatened to resign. So far, Mueller’s investigation has netted more than a dozen indictments, three guilty pleas from former Trump associates, and earlier this month a federal judge handed down the first sentence stemming from the probe, ordering Alex van der Zwaan, 33, a son-in-law of a prominent Russia-based banker, to serve 30 days in prison.